The nation's largest interactive conference takes place today in Austin, Texas, but the newly-formed New Press Club is helping bring the conference to local interested in interactive media with the first-ever "South by Southwest by Cincinnati" which will tap into the South by Southwest conference being held in Austin. Event organizers say that for one hour, and possibly longer, South by Southwest by Cincinnati attendees will be able to hear some of top thinkers and most influential people in the world of interactive media. Those attending will even have the opportunity to ask questions of these individuals and get the latest news about what is developing in the industry. The live discussion will start at 5:30pm at Mainstay Rock Bar tonight in downtown Cincinnati (map), and will include a networking and social time immediately after the live discussion. The event is free and open to anyone who wants to come, and those with Twitter accounts are encouraged to follow @NewPressClub for live updates. 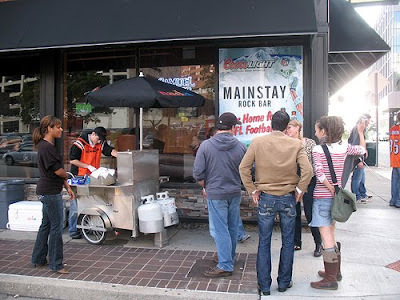 Mainstay Rock Bar exterior photo by 5chw4r7z.